What Should You Expect When You Become a Mentor? 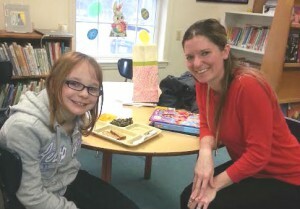 | Garrett Mentors, Inc.
A mentor and child in our program during a lunchtime mentoring session at the child’s school. Adult volunteers of all ages backgrounds and skills become mentors by applying online and undergoing a National background check and interview process. When the process is complete, these mentors are matched with a child who has been referred to the program. Children are referred to the program by their school staff or their parents for various reasons. Some children are in need of extra academic support while others benefit most from the social aspect of working with a dedicated adult support system. The child’s needs are outlined and passed on to the director of our program. When the mentor and child are matched together, they begin meeting once a week at the child’s elementary school during the child’s lunchtime which varies from school to school and grade to grade, but this time frame is anywhere from 30 minutes to one hour. Each mentor chooses which day during the week that they would prefer to use for their mentoring sessions. Some mentors are not able to go on the same day every week, and so they keep the school informed of their schedule on go on the day of the week suits them that week. Other mentors prefer to go on the same day each week. Mentors provide a listening ear, a consistent positive role in the child’s life and provide support for the child based on the child’s unique personal needs and interests. The bottom line is that no mentor/mentee relationship looks the same and so no mentor session looks the same. Some mentees and mentors may read together or do school work, some may play games or just talk. Some mentors take walks together around the school grounds or throw football together. It all depends on the individual child’s needs and the relationship that is formed between the mentee and the mentor. Aside from the in school activities, children and their mentors are invited to attend various events together throughout the year. Some mentors provide transportation to their mentee for these events. Past activities the children and mentors have enjoyed together include a Holiday party, snow tubing at Wisp Resort, an outing at Funland, a fishing day and a summer picnic with swimming and boating on the lake. As an organization we have many more ideas in mind for our children, including a new focus on providing our children with opportunities to learn the importance of and practice of serving others and giving back to the community in a number of ways as well.